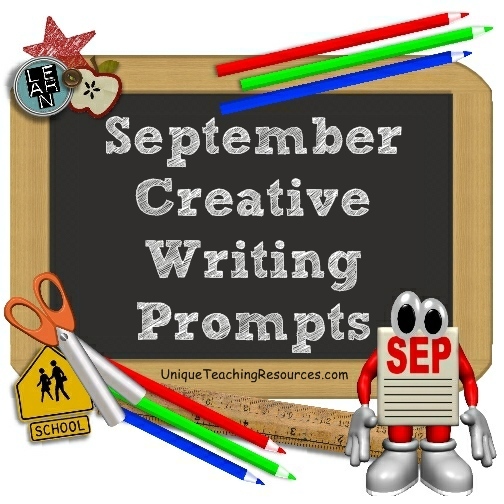 Are you looking for a creative list of writing prompts and journal ideas to use during the month of September? 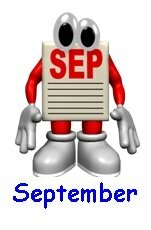 Below, you will find a list of general September writing topics and a list of specific calendar dates for September which contain creative writing ideas related to that particular date in September. I have created this list of September writing prompts for elementary school teachers and students, but many of these creative writing ideas and topics would also be appropriate for other grade levels. 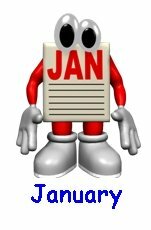 You will be directed to another page on Unique Teaching Resources that contains detailed lesson plan ideas and printable worksheets for those September writing prompts. 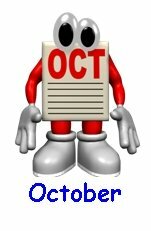 You will be directed to another website that contains useful information related to those particular September writing prompts. 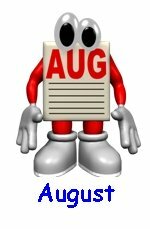 to also look at the writing prompt ideas on my August page. Compare what it was like being in first grade to the grade that you are in now. What things are similar? What things are different? 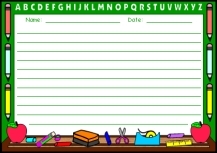 These chalkboard printable worksheets can be used for many of the September writing prompts that are found on this page. 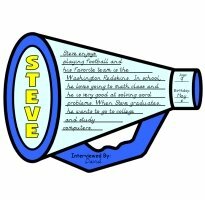 What is your most significant memory from each grade level in school? 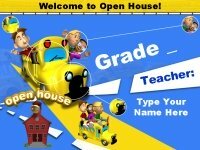 These school bus printable worksheets can be used for many of the September writing prompts that are found on this page. 10 things every ______ grader should know. These Write All About It printable worksheets can be used for many of the September writing prompts that are found on this page. How did you feel about the start of this new school year? Were you excited or nervous? How do you feel about it now that school has started? Write a paragraph about how your feelings have changed. These book bag templates can be used for many of the September writing prompts that are found on this page. If you could eliminate one subject or one activity to your school day, what would it be? Invent a new subject for your school. Why would students enjoy having this new subject in school? 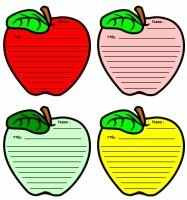 These apple templates can be used for many of the September writing prompts that are found on this page. My goals for Grade ___. A kind teacher that I will always remember. If you were a teacher, what subject would you like to teach the most? What grade level would you like to work with the most? Our very strange substitute teacher. Ten crazy reasons why I couldn't do my homework. If you could choose any animal for a class pet, what animal would you choose and why? Write a description about yourself, your interests, and hobbies. Here's what a new student needs to know about my school. If you were the principal of your school, what would you do? If you were a principal and you had to hire some new teachers for your school, what qualities would you look for in a teacher? Explain what would make a good teacher. Write an About Me poem about yourself. Imagine that you are a student 100 years in the future. What do you think school would be like in the future? What would you study? Where would you study? Write a story about it. Describe the characteristics that make you a colorful student. Choose 5 adjectives that you feel describe you the best. Pretend that you are packing your lunch for school and you may pack anything you want. What would you pack? Why? If you were asked to design a menu for the cafeteria for one week, what would it consist of? Interview one of the students in your class. Then write a paragraph about your partner that introduces him or her to the rest of your class. If you had to design a new uniform for your school, what would it look like? You have been selected to invite a guest speaker to visit your school. Who would you select? Explain why. You have been selected to invite a musical guest to perform at your school assembly? Who would you select? Explain why. 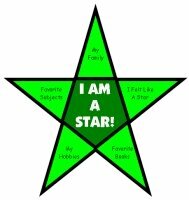 Meet the Stars of Our Classroom! Describe the qualities that make you special. Everyone likes snacks! Write instructions that explain how to make a healthy snack that would be good to pack in your lunch box. Write an essay on the benefits of a healthy diet. Describe five activities that you enjoy doing after school. 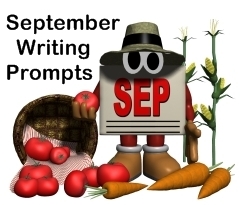 about each of these September writing prompts and holidays. Labor Day is celebrated on the first Monday in September and recognizes and honors American workers and their achievements. The first Labor Day in the United States was celebrated on September 5, 1882 in New York City. Labor Day is recognized by most Americans as the symbolic end of the summer and the holiday is often regarded as a day of rest. What profession do you want to enter when you finish school? Write about a profession whose work you admire and respect. Visit Wikipedia's Labor Day page to learn more about the history of Labor Day. The Bureau of Labor Statistics has information about careers that students can read more about based on their own interests and hobbies. The A to Z List of Careers contains links to over 50 different career choices that students can go to in order to read information about a career that interests them. Grandparents Day is celebrated the first Sunday after Labor Day. This day is devoted to honoring grandparents and to help children become aware of the strength, information, and guidance that older people offer. In 1978, the United States Congress passed legislation, which was signed by President Jimmy Carter, proclaiming the first Sunday after Labor Day as National Grandparents Day. September was chosen as the month for this holiday to signify the "autumn years" of life. Interview one of your grandparents, or ask your parents to tell you about your grandparents. Then, draw a venn diagram and compare your life to one of your grandparents when he or she was your age. How was your grandparent's life similar or different to yours? 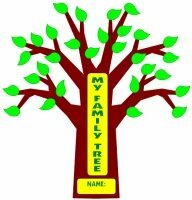 Create a Family Tree: Click on the following link to go to my web page that contains unique tree and leaf templates that your students can use to create their own family tree projects. Go to Heidi's Family Tree Lesson Plans. Today is Cheese Pizza Day. 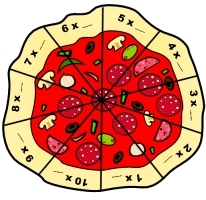 Pizza originated in Italy, but it is now one of the most popular meals in many countries around the world. Write a letter to your parents explaining why your family should have pizza for dinner tonight. Write a recipe for how to make your favorite pizza. Include the ingredients needed and the directions for each step in the recipe. 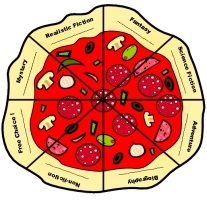 The beginning of a new school year and Cheese Pizza Day is an ideal time to introduce your students to my Pizza Reading Sticker Charts that will encourage your students to read books independently this school year. September 8 is International Literacy Day. Illiteracy is an overwhelming problem in developing nations. Reading and writing are tools for eradicating poverty, a means of reducing child mortality, and the key to gender equality. September 8 was proclaimed International Literacy Day by UNESCO (United Nations Educational, Scientific and Cultural Organization) and it was first celebrated in 1966. 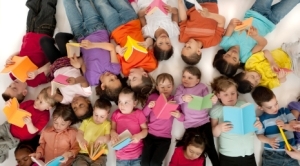 The purpose of this day is to highlight the importance of literacy to individuals, communities, and societies. On International Literacy Day each year, UNESCO reminds the international community about the status of literacy globally. UNESCO estimates that 20% of all adults, or 774 million people, are not literate and two-thirds of these people are women. There are 75 million children who are not attending school, and there are many more children who attend school irregularly or drop out of school. Imagine what it would be like growing up and not knowing how to read and write. Describe how you would feel and what this would be like. Wikepedia's List of Countries By Literacy Rate contains an ordered list (1-178) of the literacy ranking of 178 countries. Maps of the World contains a World Illiteracy Map which shows a visual map of the world based on literacy rates of different countries. Visit Wikipedia's United Nations Educational, Scientific and Cultural Organization page to learn more about UNESCO. 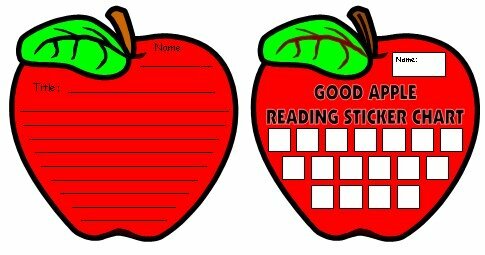 International Literacy Day is a perfect day to begin using reading incentive charts with your students. My I Love Reading Sticker Charts will help you to motivate your students to read 16 books in the time period that you select. 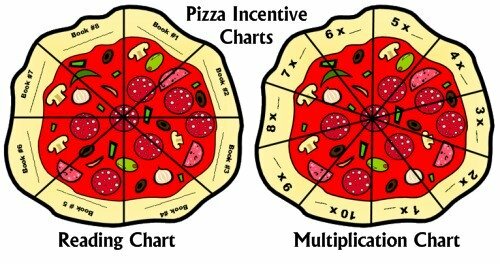 You can view all of my different reading sticker charts on this page: incentive and sticker charts. Roald Dahl was born on September 13, 1916 in Cardiff, Wales. Roald Dahl is one of the most popular and best-selling children's book authors of all time. Many of his books have been adapted into successful movies. Have you seen any movies based on one of Roald Dahl's books? If so, which did you like the best, the book or the movie version? Write a famous quote by Roald Dahl on your chalkboard or whiteboard and have your students respond to this quote. I use the date of Roald Dahl's birthday to read aloud one of his shorter picture books to my class and one of my favorites is The Enormous Crocodile. On my Enormous Crocodile lesson plans page you will find templates for a gigantic crocodile group project. Two other short Roald Dahl read aloud books that feature animals in them are Esio Trot and The Giraffe and the Pelly and Me. For an extra large tortoise group project, go to this page on my website: Esio Trot lesson plans. 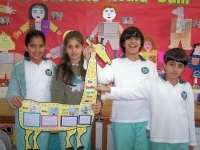 My The Giraffe and the Pelly and Me lesson plans page contains a fun giraffe project that is 3 feet tall when it is assembled together. Use the date of Roald Dahl's birthday to begin reading one of his longer chapter books to your students. One of Roald Dahl's most popular chapter books is Charlie and the Chocolate Factory. On my Charlie and the Chocolate Factory lesson plans page you will find a large group project for students to create an extra large Willy Wonka Chocolate Factory. Have your students complete a Biography Newspaper Project about Roald Dahl. These newspapers can be assigned as individual or group projects. 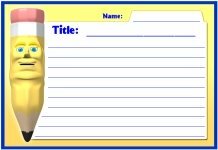 Have your students complete a Character Body Book Report about Roald Dahl. These reports can be assigned as individual or group projects. Visit Wikipedia's Roald Dahl page to learn more about his life and work. Students will enjoy visiting Roald Dahl's Official Website. Students can learn more about Roald Dahl and his books at the Roald Dahl Museum and Story Centre. We celebrate Mayflower Day on September 16. In September 1620, the Mayflower sailed from Plymouth, England to America. There were 102 passengers and a crew of 25 - 30 on board. Their destination was the New World, where they could have religious freedom, and continue using their native language, culture, and customs. 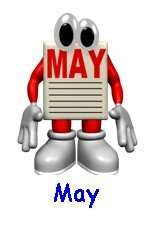 Every Mayflower Day, we commemorate these brave, early settlers. They were the very first immigrants, and helped to pave the way for millions more to follow, in search of freedom and the dreams and promises of a New World. Imagine what it would be like to leave for a new land thousands of miles away. What 5 things would you bring with you if you were moving to a new land and could not bring everything that you owned with you? Scholastic's Thankgiving page provides information about the voyage of the Mayflower and the first Thanksgiving. Visit Wikipedia's Mayflower page to learn more about the voyage of the Mayflower. Constitution Day is celebrated in the United States on September 17 and it is also known as Citizenship Day. This day celebrates the formation and signing of the U.S. Constitution by thirty-nine men on September 17, 1787. Design a Classroom Bill of Rights. What kind of freedoms would you include in your Classroom Bill of Rights? Would these rights make it easier for your teacher to conduct lessons, or would some of these rights get in the way of learning in the classroom? The Constitution states that a person must be at least 35 years to be elected president. Do you think this is a good idea? Why or why not? Explain what you think it means to be a good citizen of the World, the United States, your state, your town, and your school. Pretend that you have a pen pal from another country and he or she is moving to the United States. Write a letter to your pen pal and tell them what you think are the best parts of living in the United States. The Charters of Freedom website provides information and free downloads about the Constitution and Bill of Rights. A website about the Constitution for children can be found at The Constitution For Kids. The International Day of Peace, also known as World Peace Day, is celebrated on September 21. 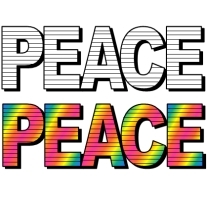 This day is dedicated to peace, or specifically to the absence of war. It is observed by many nations, political groups, and military groups. 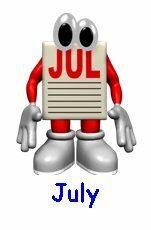 The first year this holiday was celebrated was 1981. To recognize the beginning of this day, the "Peace Bell" is rung at UN Headquarters. The bell is cast from coins donated by children from all continents. What the word "peace" means to me. Who is a peaceful person that you know? Who is a peaceful person that you admire? Why has world peace been hard to achieve? Why is it important to have a Peace Day? 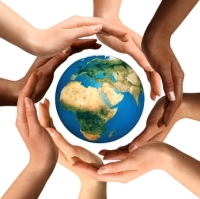 What needs to happen for world peace to occur? How can children promote peace in the world? If you had to grade the world on its peacefulness, how would it score? What can you do to help keep peace in your school and your classroom? Write a speech that you will present to the UN representatives from around the world on World Peace Day. 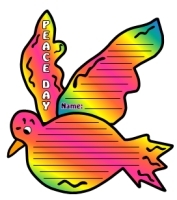 Click here to go to Heidi's Peace Day Lesson Plans page. 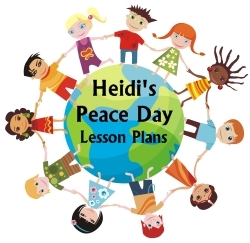 Above: Examples of Heidi's Peace Day Lesson Plans and projects for elementary school students. A book that I have read with my students at this time of the year is Sadako and the Thousand Paper Cranes by Eleanor Coerr. This book is set after World War 2 and is about a young Japanese girl who develops leukemia from the atomic bomb that was dropped on Hiroshima. This book is based on the true story of a Japanese girl named Sadako. Visit Wikipedia's International Day of Peace page to learn more about this holiday. 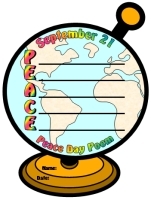 The International Day of Peace web site has information about planning your own Peace Day and a Peace Day Cease Fire. On The Official Web Site of the Nobel Prize children can read about the outstanding people who have been awarded the Nobel Peace Prize. The site includes biographies, lectures, and educational material. National Dog Week is celebrated the 4th week of September. National Dog Week was founded in 1928 by Captain Will Judy, who was a well known dog judge and a publisher of a dog magazine. The purpose of National Dog Week is to educate dog owners about their responsibilities to their pets and to recognize organizations that are dedicated to caring for unwanted or lost dogs. 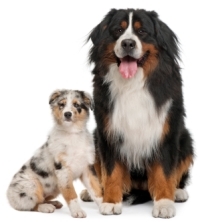 What are the responsibilities involved in having a dog for a pet? If you have a dog, how to you help to take care of your family pet? There is a saying that a dog is man's best friend. How do you think this saying came to be? Great Dog Site contains a list of dog breeds in alphabetical order that includes photographs and information about each breed of dog. During National Dog Week read your students the Newbery award winning book Shiloh by Phyllis Reynolds Naylor. For lesson plans and fun projects to use with this award winning novel, click here to go to Heidi's Shiloh lesson plans page. 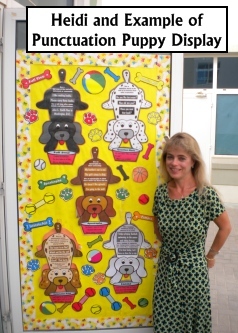 I have created puppy shaped reading sticker charts that would be great to use with your students during National Dog Week. Click here to go to Heidi's puppy reading sticker charts page. During National Dog Week have your students complete a fun book report project using unique dog shaped book report templates. Click here to go to Heidi's dog book report templates page. Are you interested in a punctuation display that uses dog templates? My grammar bulletin board displays page contains 12 dogs templates featuring the following punctuation marks: period, comma, exclamation point, comma, apostrophe, quotation marks, colon, semicolon, parenthesis, ellipsis, hyphen, and dash. The photograph on the right shows examples of 5 Punctuation Puppies. Sheldon Allan Silverstein was born on September 25, 1930. He is better known as Shel Silverstein and he was an American poet, singer-songwriter, musician, composer, and cartoonist. 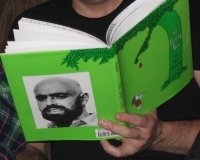 Shel Silverstein's books have sold over 20 million copies and his most famous children' book is The Giving Tree. The date of Shel Silverstein's birthday is a wonderful opportunity to read one of his books or poems to your class. Students will enjoy visiting Shel Silverstein's Website. 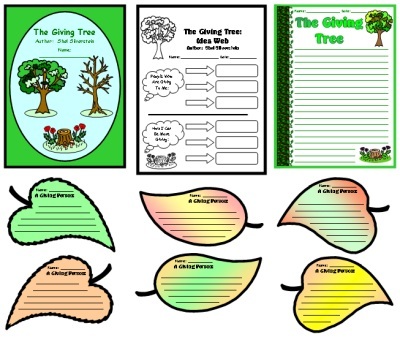 If you are interested in teaching resources for The Giving Tree, click here to go to my web page that contains ideas and teaching resources for this book: The Giving Tree Lesson Plans. 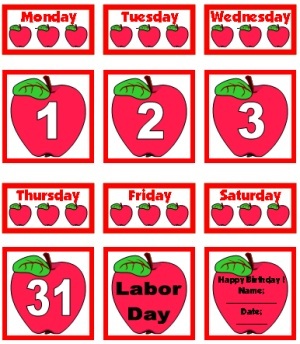 Johnny Appleseed's birthday is a perfect day to begin using reading incentive charts with your students. 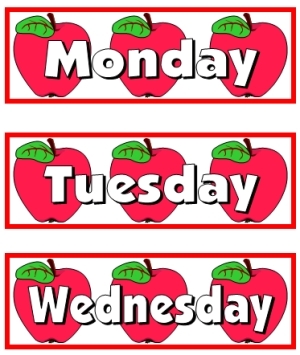 My apple sticker charts (shown below) will help you to motivate your students to read 17 books in the time period that you select. September 28 is National Good Neighbor Day. On this day, people should remember how important it is to be a good neighbor and that people should recognize and appreciate their neighbors. In 1971, Becky Mattson of Montana petitioned and was granted the idea of National Good Neighbor Day. This day was originally celebrated on the fourth Sunday of September, but it is now set as September 28. What can you do to be a good neighbor to the people that live around you? What can you do to be a good neighbor to your classmates? This printable calendar set for September includes smaller calendar pieces for the 7 days of the week that will fit inside your calendar pocket chart. September teaching resources classroom display set. free download link for this September calendar set. Are you looking for a unique way for your students to create a family tree? Your students will be branching out to learn about the members of their family as they design their own family trees. This is a great project to do for Grandparents Day! 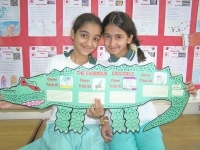 The Enormous Crocodile Group Project: For this cooperative group project, students describe the four clever tricks that the Enormous Crocodile plans in order to eat the children in town. The Giraffe and the Pelly and Me Group Project: Students work together to describe the Ladderless Window Cleaning Company, Billy, the Duke, and then write a poem together. 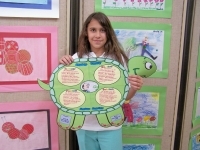 ESIO TROT Group Project: For this turtle shaped cooperative group project, students work together to describe Mr. Hoppy, Mrs. Silver, the problem, and the solution of the story. Charlie and the Chocolate Factory Group Project: For this project, students work together to write descriptions and draw pictures about what happens to the four naughty children in the factory rooms. 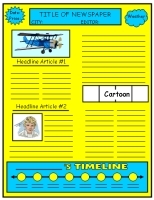 Nonfiction Book Reports: Your students will enjoy being newspaper editors and writing articles, cartoons, and timelines about the life of Roald Dahl and the novels that he has written for children. 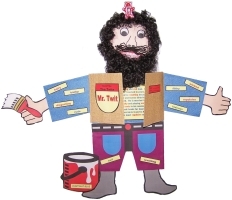 Your students will love designing large character body projects about Roald Dahl. Students choose adjectives that describe Roald Dahl and then write an essay about him, as well as his novels. 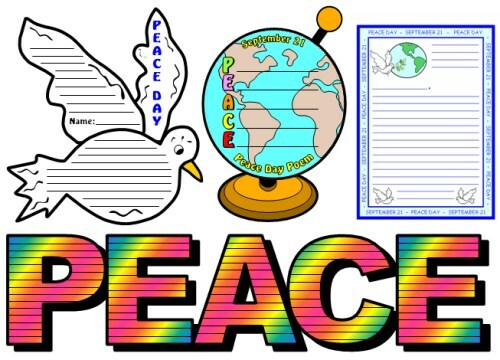 For these Peace Day worksheets, students write a letter to the President, or a world leader, about the topic of world peace. Students write an acrostic poem with the letters that form the word P.E.A.C.E. Students use globe templates to complete the final drafts of their poems. 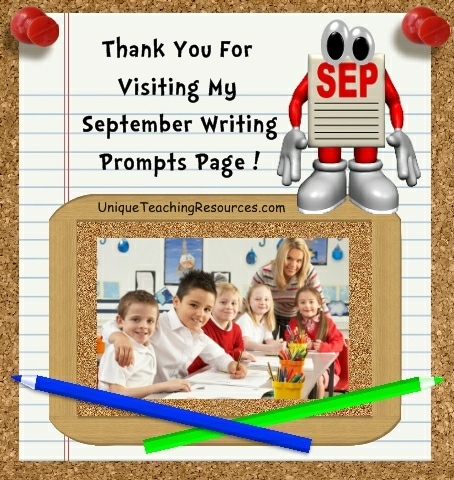 Thank you for visiting my September writing prompts page.